Less than 25 miles outside of Detroit, Troy has both the conveniences of city life and the pleasures of the Michigan countryside. The Rouge River runs right through the Stage Nature Center, where you can capture the deer, squirrels, turkeys, and other local fauna on a photo walk with the Troy Nature Society Photo Club. Stage Center’s Rent-a-Maple Program lets you tap a borrowed tree for sap, then distill it into syrup in the Maple Sugar Shed. Get in touch with nature—or simply get your game on—at Troy’s parks and recreation facilities. Flex your wrist for eighteen holes of Disc Golf at Firefighters Park. It’s nothing but net at Boulan Park, where you can improve your backswing on the tennis court or lunge for that spike in sand volleyball. With its fantastic community athletics programs, catering to everyone from preschoolers to pensioners, it’s no wonder that Sports Illustrated named Troy “Michigan’s Sportstown” in 2003. Troy is home to amateur athletes and pros alike. Major League Baseball pitcher and coach Steve McCatty graduated from Troy High School. Hall-of-Famer Rick Ferrell, a celebrated catcher who played for the St. Louis Browns, the Red Sox, and the Senators during the 1930s and 40s, lived in Troy in his golden years. NHL defenseman Sean Collins of the Washington Capitals was born in Troy. Off the playing field and on stage, Troy is well-represented by musicians like Bridget Regan, vocalist and violinist from Celtic punk band Flogging Molly—and metalcore group, We Came as Romans. Metal musician and songwriter Tomo Miličević, former lead guitarist of Thirty Seconds to Mars, is part of a talented set of siblings: His sister, Ivana, plays a dual role in Cinemax’s Banshee. Her acting colleagues from Troy include Martin Klebba of Scrubs and Pirates of the Caribbean; Steven Yeun, who brings Glenn Rhee to life on The Walking Dead; and Ellen Hoffman, known for her guest star roles in NCIS, CSI, Medium, Criminal Minds, and The O.C. For business owners, company cars and trucks are like moving marquees—and your products and services are the featured stars. When it’s your chance to catch customers’ eyes, don’t settle for dull, outdated techniques like generic vinyl lettering. 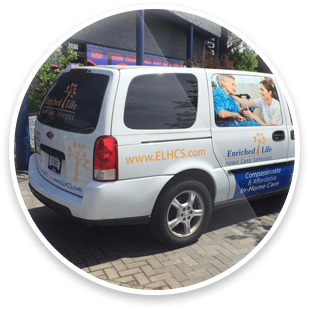 Choose vehicle wraps from the company that knows how to make your brand shine. Perfect Impressions Graphic Solutions will create one-of-a-kind, captivating car wraps to get your customers’ attention—whether they’re cruising down I-75 toward the restaurants on West Big Beaver Road or running errands on Woodward Avenue. Perfect Impressions can get your message across, loud and clear, to motorists on Telegraph Road. Our car wraps will boldly go where paint cannot dare, safely covering even windows and bumpers. With our meticulous technique and state-of-the-art facilities, we’ll make sure that the dynamic colors and original designs you choose for your car wraps will stop traffic. Perfect Impressions Graphic Solutions is the premier choice for vehicle wraps in Troy. But did you know that we also offer other branding options, including custom-made magnets and decals? Whatever your needs for marketing materials, Perfect Impressions can help put your company on the map—in Troy and beyond.